On June 12th, CESVA travelled to Seville to impart a workshop about the instrumentation for environmental measurements: sound level meters, vibrometers, acoustic and vibration calibrators and environmental terminals for noise monitoring. Also a demonstration of insulation measurement with the GIP (Global Insulation Package) solution was perfored, using the new AP602: noise generator + graphic equalizer for 1/3 octave and amplifier with remote control and Bluetooth® wireless technology incorporated (with only 4.5 kg of weight). Finally, we presented the LIDACO system for online inspection of acoustic limiters without displacements which has been approved by Ordinance 6/2012 approving the Regulation on Protection against acoustic Pollution in Andalusia. 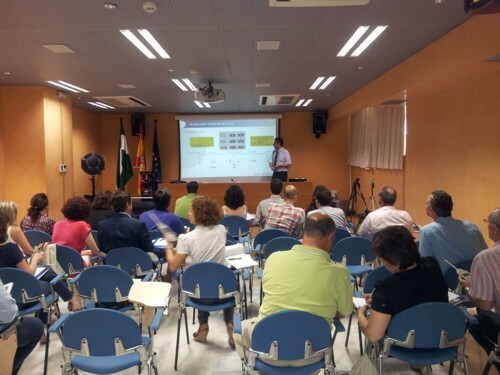 The workshop was held in the facilities of Junta de Andalucía and was attended by 25 technicians for all Andalusia.